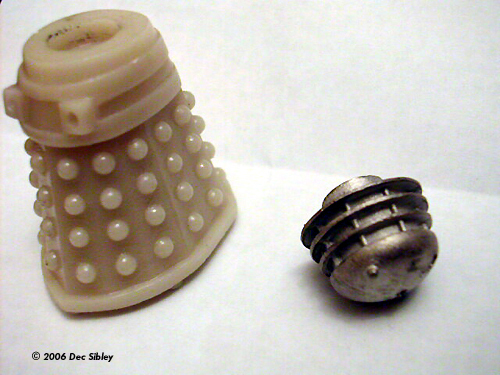 It is said that a fool and his money are easily parted, well thanks to Ebay its even easier, and I found myself bidding for these 1/35 Daleks with out a second thought. Made by Media Collectables I bought 3 in the end and paid about �.00 for the lot (approximately $34.87), which I didn't feel, was to bad as they are no longer in production. (See note at bottom) One of these later went for �.00(approximately $52.30) for a single Dalek so perhaps I got a bargain after all. This 搃n box� review will be brief as there is little inside the packaging. 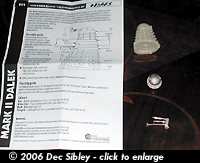 The scale means the model stands at 50mm tall when assembled. 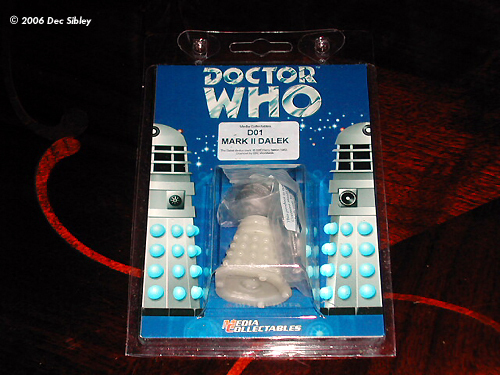 This is however one of the best things about these Daleks. Being 1/35 scale means that a whole host of military kits of vehicles or Diorama accessories can be used, something I'm already working on. 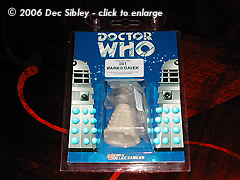 The carton is a clear plastic bubble pack with the components visible, flanked by Dalek artwork. 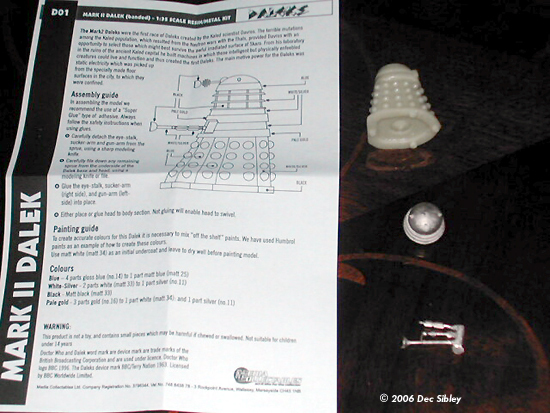 Inside is a sheet of instructions and the bagged up pieces consisting of a resin body a white metal head and grill plug and finally a small white metal sprue of 3 parts for the sucker, gun and eye stalk. The parts are excellently cast, no bubbles on the resin and a very fine mould seam to remove from the head dome. Super glue will be required for the build but nothing arduous is expected. The head can be turned to various angles as the plug is circular but ensure the grill supports are lined up correctly. 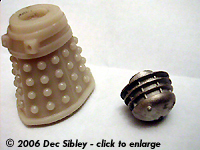 The underside has a roller moulded as well as some lugs to raise the Dalek of the ground but keep it stable. I would advise removing the lugs and pining the model so it appears to be just floating along above the surface. Painting will be the most challenging part, with some sort of mask perhaps necessary to do the sensor domes on the skirt. A full list of Humbrol colours is listed in the instructions with the mix ratio to get an exact replica from the Doctor who series. Various other combinations of colour are shown on the reverse of the pack. It would not take much effort to convert these Mk 2 Daleks into later generation Daleks by gluing plasticard slats around the waist, although Media Collectables did produce some Mk 3 Daleks also. All in all a simple but well produced product I look forward to spending time on. Note. Media Collectables ceased producing a small range of excellent figure kits in March 2003 when the BBC withdrew the licences that were then running in order to prepare for the upcoming new series and introduce a cohesive identity on its new products. There are still shops with the Media Collectables on their shelves and with luck and a good hunt can currently be picked up for about �00. Many thanks to wallet for providing the review samples. Manufacturers and retailers, interested in getting your wares reviewed and publicized on a site averaging 3500+ readers a day? Contact us! This page copyright © 2006 Starship Modeler. First posted on 5 April 2006.